Dress the hook with thread to a point opposite the barb. 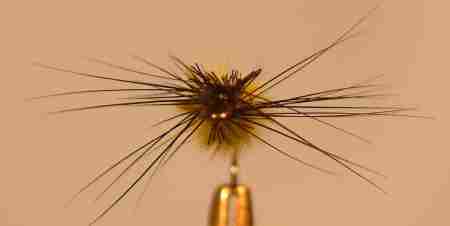 Tie in a small bunch of Black Hackle fibers and the ribbing at the same point. Strip a bunch of marabou fibers from the quill and tie in by the points, Wind the thread up to near the eye of the hook. Twist the marabou fibers into a rope an wind forward in touching turns to form the body. Stroke the fibers back between each turn. Tie off allowing space for the hackle and head. Trim excess marabou. Trim the hackle fibers above and below the shank as shown below.